Low-profile gas block fits under just about any extended handguard while ensuring proper gas flow to keep your rifle cycling reliably. Precision machined from lightweight, yet tough, 6061 T6 aluminum, so it won’t add unwanted forward weight. 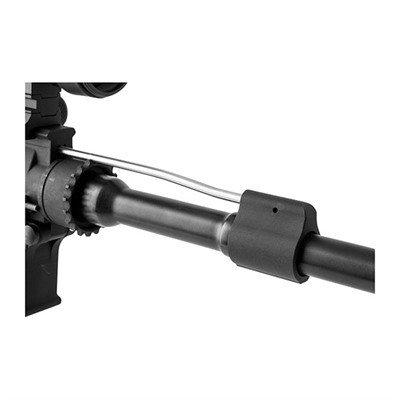 Slide over the barrel and anchor in position by tightening the three, flush-mounted steel hex screws on the underside to ensure it won’t shift even under sustained full-auto fire. For installations where the gas block is exposed, rounded edges give a “melted” profile that won’t snag on foliage or other gear. Hardcoat anodized for additional strength and resistance to surface wear; matte black finish blends with most factory gun finishes. SPECS: 6061 T6 aluminum, hardcoat anodized, matte black. Includes (3) hex-head screws and instructions. .750" - Fits barrel with .750" O.D. at gas port. 1.25" (3.2cm) long, 1.35" (3.4cm) overall height, .95" (2.4cm) outside width. .8 oz. (23g) weight. .936" - Fits barrel with .936" (2.38cm) O.D. at gas port. 1.25" long, 1.5" (3.8cm) overall height, 1.15" (2.9cm) outside width. 1 oz. (28g) weight.